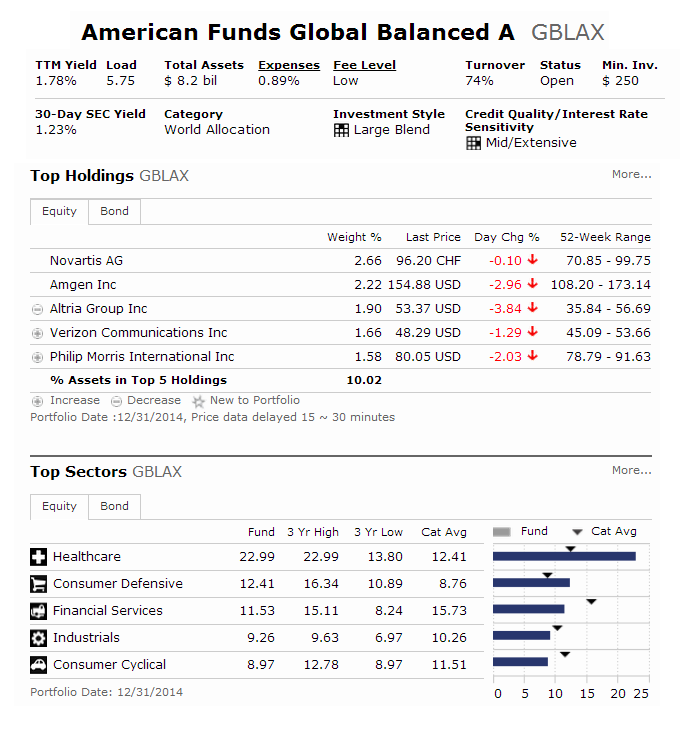 This American Funds Global Balanced fund has an expense fee of 0.89%. It also has a dividend yield of 1.78%. The current share price is $30.28. The class A fund has a high sales load of 5.75%. The fund’s investment style is large blend. The equities breakdown is as follows. Top 4 sectors are healthcare, financials consumer discretionary, and consumer staples. Top 3 industries include tobacco, pharmaceuticals, and oil & gas fuels. Top 5 stocks are Novartis, Amgen, Verizon Communications, Altria, and SSE. The fixed incomes breakdown is as follows. Top 3 bond holdings are Non-US government/agency securities, US government/agency securities, and corporate bonds. Top 3 regions are United States, Europe, and Asia Pacific Basin. This American Funds Global Balanced Fund is ranked high by Morningstar. The expense fee is higher than index fund. The class A fund has a sales load.